Happy Saturday, everyone!! Did you have a wonderful Friday and start to your weekend? We went out to dinner with our friends Misty & Chris, and Misty's daughter, Sami. Then they came over to our house and we played Clue & Life on the XBOX. We got snacky as the night went on, and I made us some yummy peanut butter covered popcorn. It was a wonderful evening with our friends! Today has just been a lazy day of watching football so far. Auburn lost again (bummer), and the Griz are playing right now. Hopefully we win!! 1. Make A2 card from orange cardstock. 2. Cut floral paper slightly smaller, then adhere. 3. Cut white cardstock slightly smaller, then diecut three circles from the bottom & adhere with foam adhesive. 4. Add a wooden clip & rhinestone to the upper left corner. 5. Layer the resin, wooden heart, twine bow & flowers to the top of the diecut circles. 6. Add the first part of the sentiment above the diecut middle circle with alpha stickers. 7. Stamp the banner, cut out and adhere below the twine bow to finish the sentiment. I hope you enjoyed my clean & simple, yet embellished card this afternoon!! I didn't have a post ready for yesterday, so I am going to add my Bible study notes to today's post. What a beautiful section of verses. I read them over & over again today. Verse 17 is the wisdom I long for....pray for...want so completely in my life. It says, "But the wisdom that comes from heaven is first of all pure; then peace-loving, considerate, submissive, full of mercy and good fruit, impartial and sincere." All I can think about is how amazing our world could be if we all sought after this type of wisdom. So many wars and senseless acts have been done in God's name. I can only imagine the sorrow that God must feel when His name is misused and so completely misunderstood. I know it makes me feel sad. OK first off....thank you so much for all your sweet comments today! Totally made me smile! I am so glad I clicked on your profile and it brought me here! I loved reading your thoughts on these verses in James! Amazing! And so true! What an awesome way to spread the word! Your card today is gorgeous! I love the die cuts at the bottom. What a fun way to layer the embellishments. Just beautiful! Stunning piece of art Lea! Thanks so much for joining us in our first challenge at CAS(E) this Sketch! Lea, your blog is just a joy to read and your cards are snippets of happiness! I love the layers on this card and the echoing of the circle cut outs with the circle letters. It's amazing. So glad to see you over at CAS(E) this Sketch! Stunning design, Lea! I adore how you layered the gorgeous images (a skill that I am lack of...). Thanks for sharing the verses and thoughts. So true. Very glad that you played with us at CAS-ual Fridays! In other news...I wish I could be in your head to see your creative process. I just don't know how you do it. Just everything you turn out has nothing left to be placed. Everything in it's place, never needing anything and just the right amount of this and that here and there. You are an amazing designer, Miss Lea. STUNNING card Lea!!! The layers and colors are gorgeous! Love that decorative clothes pin too. So glad you played along with us in our first challenge over at CAS(E) this Sketch! Your card is realy beautiful love it. Thank you for sharing your thougths about the scripture in James. We need this kind of wisdom so hard. This is gorgeous Lea! I really like your use of the negative circles too! Wow! What a gorgeous creation - thanks so much for sharing it with us at the Simon Says Stamp challenge! 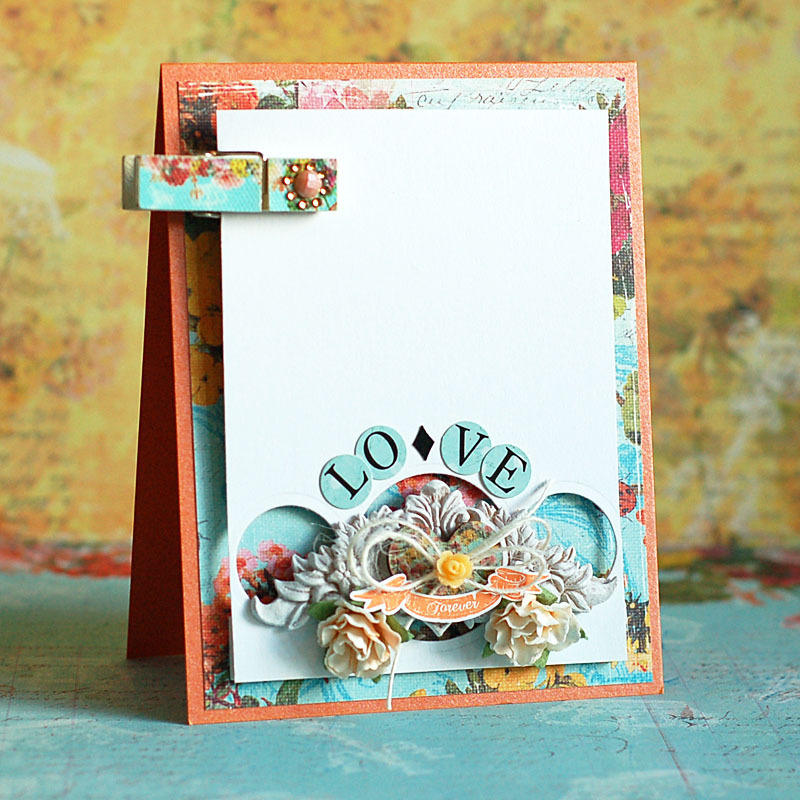 WOW....this is STUNNING as well...I am so in love with these papers and that pin is such a great addition!! Stunning card! So many details yet still striking CAS with the white space! Thanks so much for playing along with us this week at CAS-ual Fridays! what a beautiful way to use a very busy floral paper! GORGEOUS! Lea this card is super adorable and I loooove that sweet peg! Really beautiful Lea! I love the cas layout with that gorgeous cluster of eyecandy and that peg is brilliant! Thanks for playing along at Just Add Ink. gorgeous card. love the layers on your card. Wow Lea, this is stunning! So much detail, but perfectly CAS:) Love that little clothespin at the top! i can't get over the beauty in this card. magnificent! Lea, this is a work of art. It is amazing how much you packed into a cas card. Thank you so much for your inspiration.